​​ SAN ANTONIO – City Council approved the sale of about ten acres of vacant land on the Eastside to the George Gervin Youth Center for $430,000. The nonprofit community support organization has plans for a $65 million mixed-use development at 301 Spriggsdale Blvd., less than one mile south of the AT&T Center. The property and an adjacent ten acres owned by the Gervin Center will host an estimated 500 market-rate apartments and about 28,000 sf of retail space collectively called Echo East. 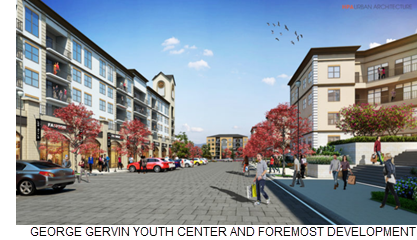 The multi-year project will be completed in three phases, the first of which will yield about 136 apartments and 10,000 sf of retail space. The development team and nonprofit will then conduct more market studies to ensure the Phase 2 and 3 align with changing demand. ​​See also: San Antonio-New Braunfels Multifamily and Retail​ Market Research.